Exiled from his house and held in the impenetrable prison of Dreadhold, Gaven's mind is lost in memories of the Prophecy—both his own memories and those of another mind trapped in his own. When a daring band of adventurers breaks Gaven and former general Haldren ir'Brassek out of Dreadhold, Gaven is forced to determine his own role in the Prophecy he remembers—a role that others would like to claim. Learn more about Storm Dragon at the Wizards of the Coast web site, where you can also find author interviews and computer wallpaper. 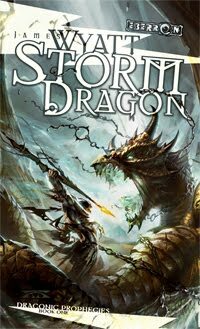 Storm Dragon was released in September 2007 in hardcover. The paperback edition came out in May 2008.